If you use a Bolt device, you can can leverage the power of the CardPointe Virtual Terminal, which allows you to accept payment cards using your computer's web browser and an internet connection. Using the Virtual Terminal, you can initiate card-not-present and card-present authorizations, captures, settlements, voids, and refunds. In addition, you can easily add and securely save customer payment information. Note: To further reduce your PCI scope, you can disable the ability to enter payment account numbers (PANs) on the CardPointe Virtual Terminal. By doing this, you will be prompted to manually key the customer's credit card number into the terminal device using the terminal keypad, which removes your workstation keyboard from PCI scope and instantly tokenizes the payment card data using CardSecure. Before you can begin processing transactions on your Bolt device with the CardPointe Virtual Terminal, you must activate the Bolt device in CardPointe and configure its settings. 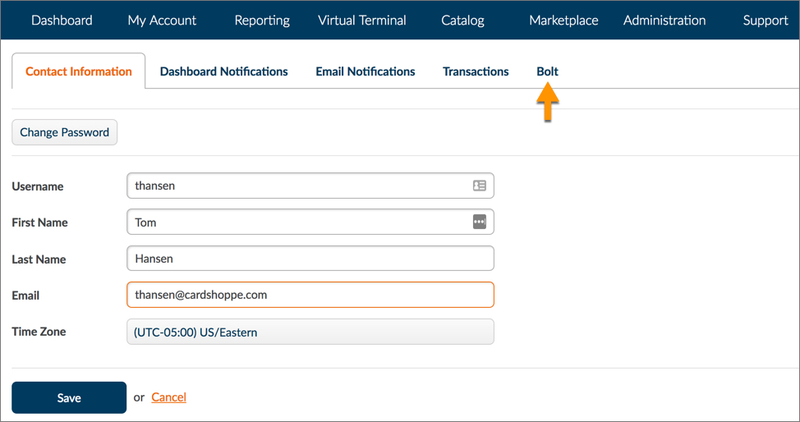 Navigate to Administration > Virtual Terminal and scroll down to the Bolt for CardPointe Virtual Terminal section. Check the box next to Activate Bolt on Virtual Terminal. Enabling this setting links your Bolt terminal with the CardPointe Virtual terminal. You can enable additional settings under the Read Card and Manual Card Entry sections by checking the boxes next to each setting. 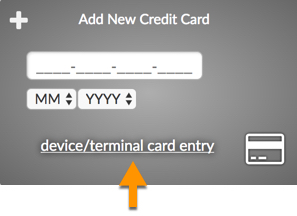 These settings impact how your customers interact with the Bolt terminal during checkout. 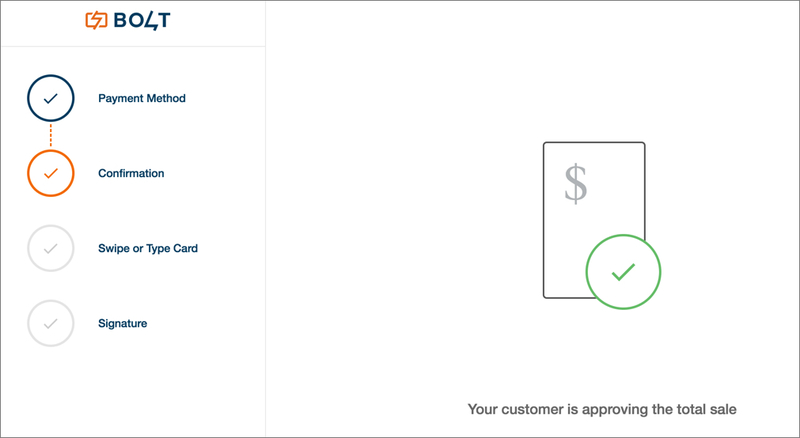 For instance, if you wish to disable the prompt for the customer's signature, simply uncheck the Prompt Customer for Signature boxes under "Read Card" and "Manual Card Entry" sections. Note: You're almost ready to use your Bolt device with the CardPointe Virtual Terminal. You just need to pair your CardPointe user accounts to the Bolt Device, and then you're ready to process! 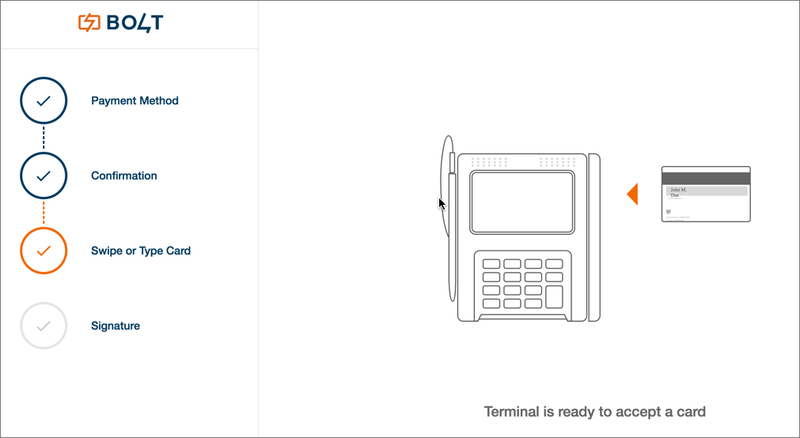 Now that you've activated and configured the Bolt terminal to work with the CardPointe Virtual Terminal, you are ready to connect (pair) your CardPointe user account(s) to the Bolt terminal. Please note that you must first activate Bolt with the Virtual Terminal before you can proceed with pairing users to the Bolt device(s) in CardPointe. If you are an admin user, it's easy to link the CardPointe users associated with your account to a Bolt terminal(s). Click the name of a user that you wish to pair to a Bolt terminal to display the "User Detail" screen. Click the Select a Terminal dropdown. Select the Bolt terminal that you wish to pair the user to from the dropdown list. The list displays the terminal hardware serial number (HSN) of each Bolt device that is associated with your merchant account. If you have multiple Bolt terminals and are unsure of which terminal to choose from the list, you can locate the the desired terminal by clicking the Identify Terminal button in CardPointe. Upon clicking this button, the corresponding Bolt terminal screen will display the Terminal Name and the Terminal HSN on its screen. When finished pairing the user to the Bolt device, click Save. The user is now ready to process transactions using the Bolt device and the CardPointe Virtual Terminal. You can repeat this process as needed to pair additional CardPointe users to your Bolt device(s). 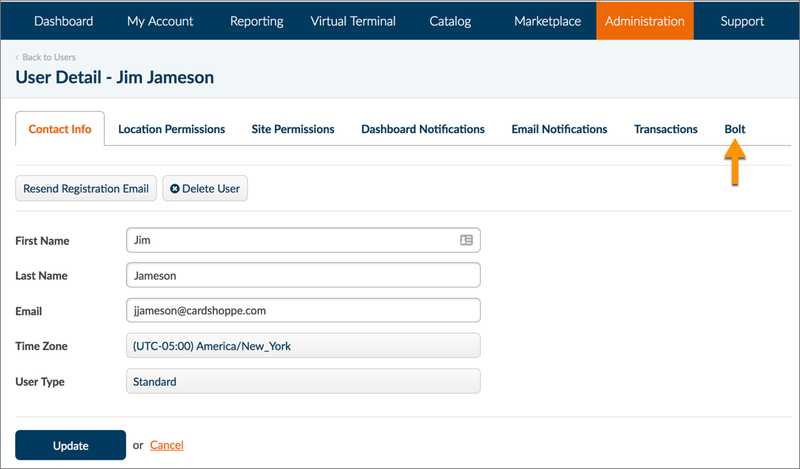 You can easily pair your CardPointe user account to a Bolt terminal to use that terminal to process transactions in conjunction with the CardPointe Virtual Terminal. Please note that you must first activate Bolt with the Virtual Terminal before you can proceed with pairing users to the Bolt device(s) in CardPointe. At the top-right of CardPointe, click the dropdown next to your username and select My Profile. Click the Select a Terminal dropdown and select the Bolt terminal that you wish to pair the user to from the dropdown list. The list displays the terminal hardware serial number (HSN) of each Bolt device that is associated with your merchant account. When finished pairing your account to the Bolt device, click Save. You are now ready to process transactions using the Bolt device and the CardPointe Virtual Terminal. If you have multiple terminals, you may wish to rename your Bolt device in CardPointe to make it easier to identify the terminal that you are using to process payments via the Virtual Terminal. Navigate to My Account > Equipment. Click the Rename button next to the desired terminal. Enter a unique name for the terminal in the Terminal Name field. Click Save. The name of the terminal displays in the "Terminal Name" field. Repeat this process for every terminal that you wish to rename. Now that you've configured your Bolt device for use with the CardPointe Virtual Terminal, you are ready to process transactions. Navigate to the Virtual Terminal screen. If you have multiple merchant IDs, select the desired merchant ID from the location dropdown. Choose whether you are processing a sale or verifying availability of funds. Choose whether you are performing an authorize and capture, or an authorize only. Enter the sale amount in the Subtotal field. EMV/Swipe - Selecting EMV/Swipe requires the customer to either swipe or dip their card in the Bolt terminal. Manual Entry - Selecting Manual Entry requires you to manually enter the customer's payment card number using the Bolt terminal keypad. Swipe (USB Device) - Selecting Swipe (USB Device) requires you to swipe the customer's payment card using your USB card swiper. Lastly, the customer is prompted to provide their signature on the terminal screen. Customers will not be prompted to provide their signature if the "Prompt Customer for Signature" setting is disabled in CardPointe. Refer to the section Process Payments with the Virtual Terminal and Bolt for information on enabling/disabling this setting. Interested in a Bolt device? Simply contact your sales partner or open a ticket in CardPointe to get the process started. For more information on Bolt devices, contact cardpointesupport@cardconnect.com.